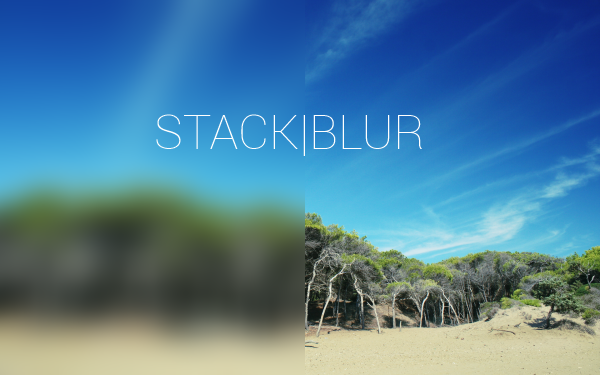 I found nice algorithm for blurring images – Stackblur by Mario Klingemann. It could do the job relatively fast and gives decent quality. You can check it here – web demonstration. As you can see it can be usable even in web projects. First is SSE friendly, second contains some division optimization via static tables. However, both are not using all cpu cores. I took second one as foundation for my implementation, as i expected my code to work on mobile devices with no SSE support. Single-core processing of 1920×1200 rgba image with 100 px radius took only 219 ms (Intel Q9550, Windows 7). I improved stackblur code to multi-threaded version – on my quad-core cpu speed results as expected showed 4x improvement – 63ms for the same task. You can download the part my lib below and use it as a foundation to your needs. I believe algorithm can be optimized even further – any suggestions are welcome. This entry was posted in C++, Design, Image processing, Kobald, Mobile development on 26 September, 2013 by Victor Laskin.